An adult of the youngest ceratopsian, Triceratops, restored with the skull of the "very adult Torosaurus." Hide follows discovery of pebbly, irregular belly scales and spikish dorsal "scutes" (non-bony). Head would be liberally covered in a close-fitted keratin sheets. 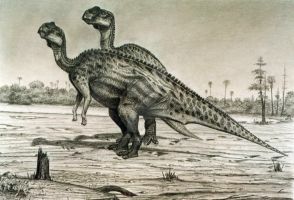 Is this more of a speculative image of the both genus if they are one and the same ? since what i ahve heard they might be the same animal. 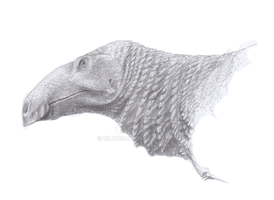 It depicts what would be called Torosaurus. The body proportions are very similar if not identical to general Triceratops. 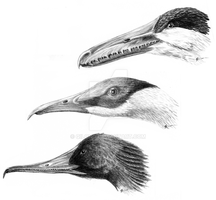 Far fewer specimens makes most of our conclusions based on the skull. For now, though, it's useful to use either of them given how similar they are to one another. They can stand in as proxies for the other in a general sense. I see , so basicly if i wanna do a torosaurus i could use triceratops skeletal but with a torosaurus head, sounds sweet. And feathering of course. I like the keratin covered frill. Thanks you! I'm still working on how real it might be. 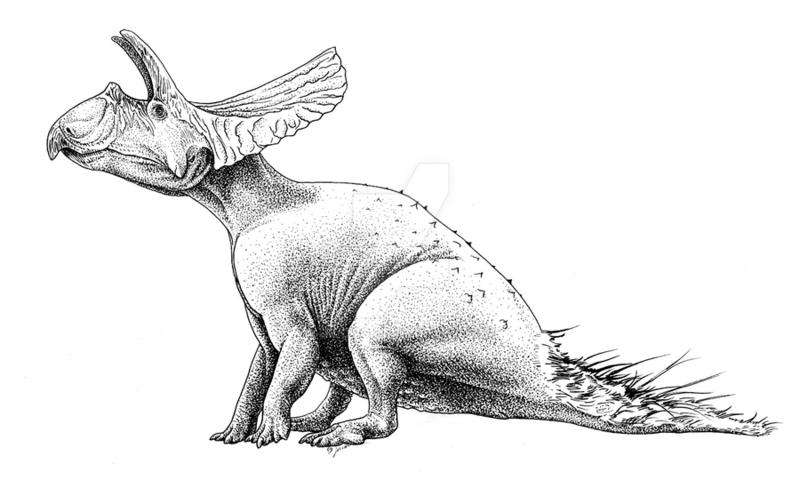 Very nice depiction of "Toroceratops", and one of the most accurate I've seen. The close fitting keratin sheets on the horns and frill are certainly interesting, and the first depiction I've seen that doesn't have skin on the frill. It seems very plausible and gives the animal a unique look. Great job. I just like playing around with implied textures using dots. Thanks muchly! Impressive, but i really do not see Triceratops being of the same genus as Triceratops. 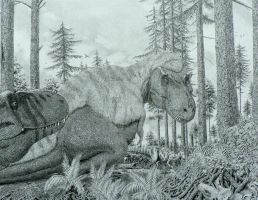 I talked with my old friend Dr. Warren Allmon, the director of the Museum of the Earth in Ithaca, New York on the subject and he and ceratopsian expert Peter Dodson both believe they are separate species based on the morphological differences and autapomorphies. Understood. I err on the side of caution and use the names separately as, at the time, their synonymy hasn't occurred through the correct (in my view) processes. That said, one can easily claim that this is merely Torosaurus. and all will be well, but the name of the illustration is, in some ways, a firestarter. i guess it could be considered as such. It's a big schnoze, I will admit. I've been mentioning the features on the blog casually. I haven't really gone into detail because, while Horner has mentioned this, he hasn't affirmed it with strict data. My own personal examination, of the dorsal and ventral surfaces of the parietosquamosal frill, is that they show superficial features, but not necessarily the histological ones, that correlate with keratin sheaths. The same structures on the horns. As for my blog, not at the moment. The footage doesn't really give a clear view of the skin impressions, but the polygonal scale mosaic was clearly visible on high-res photos on the now defunct website.